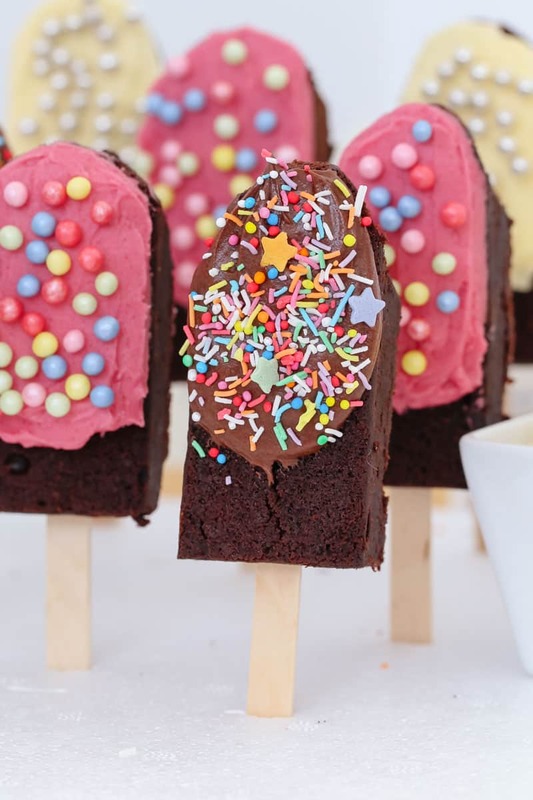 Super cute Chocolate Brownie Pops made to look just like little ice-creams on sticks! The perfect kids party food recipe. 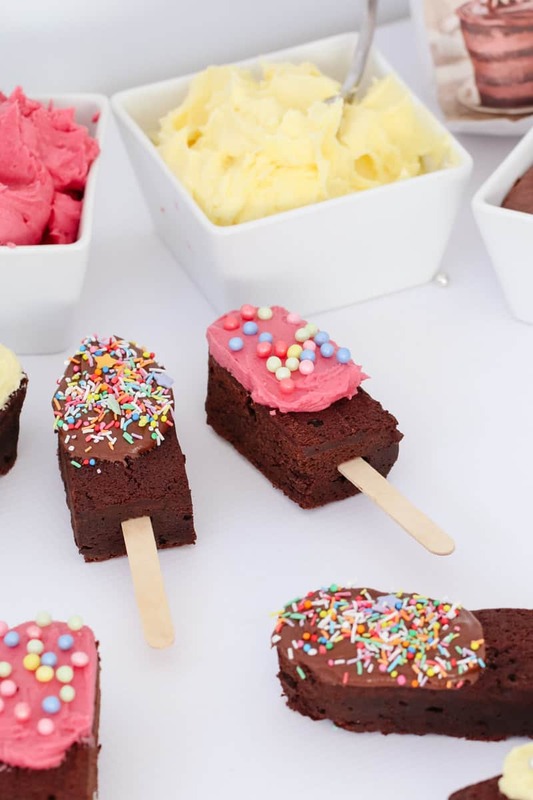 When it comes to planning kids parties… food is right up at the top of the list! 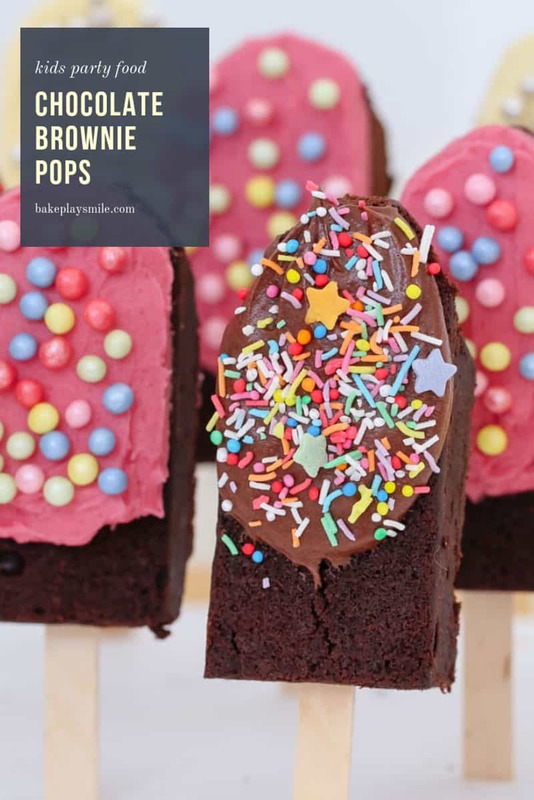 And it doesn’t get any better than these fun Chocolate Brownie Pops! 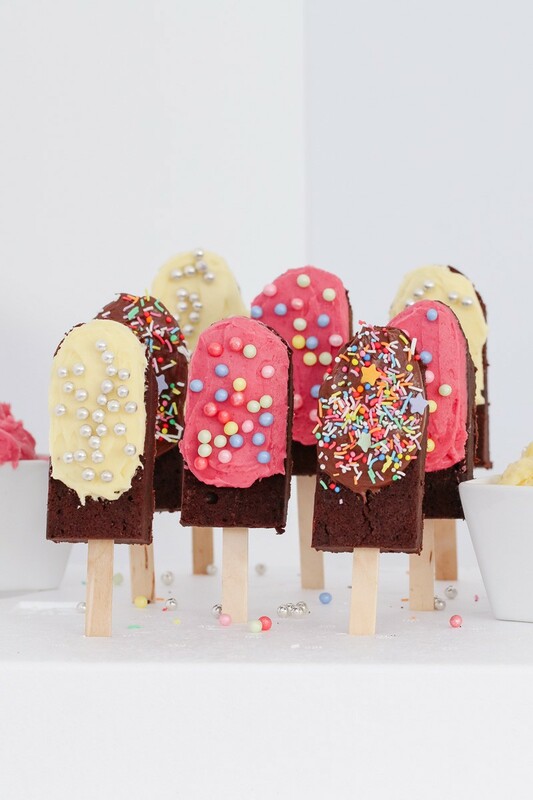 Made to look like ice-creams on sticks… simply bake, decorate and eat. Colour the buttercream with whatever food colouring you like (or match it to your party theme if you have one!). 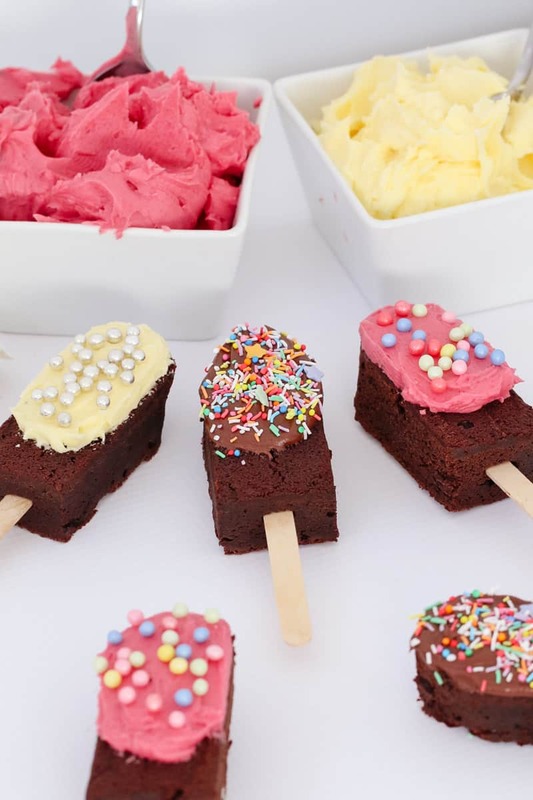 Start off by making the basic brownie mix (see recipe below) and allowing to cool. Cut into rectangles and then shape into ice-cream shapes with a rounded top. Insert the icy-pole sticks firmly into the base of each rectangle. Decorate with coloured buttercream and sprinkles. 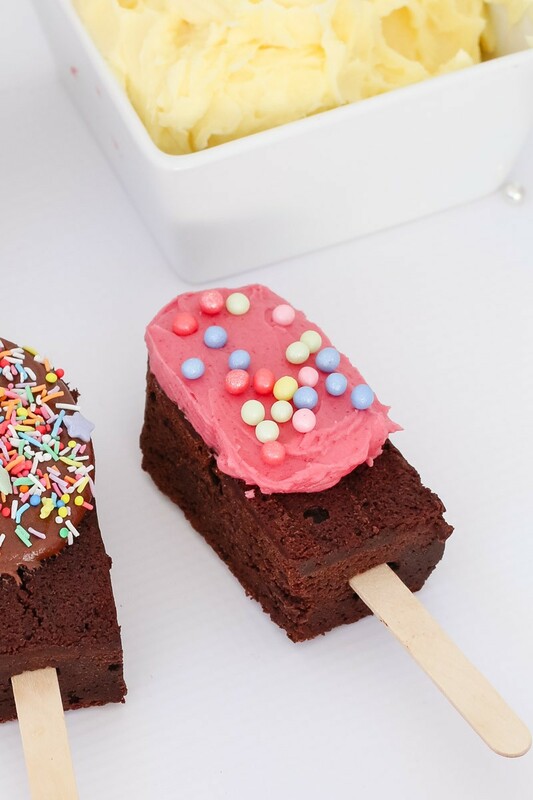 Our basic brownie recipe is super dense and moist which is essential for keeping the icy-pole sticks stay put. Colour the buttercream in just one colour or divide the mixture into different bowls and use several colours. 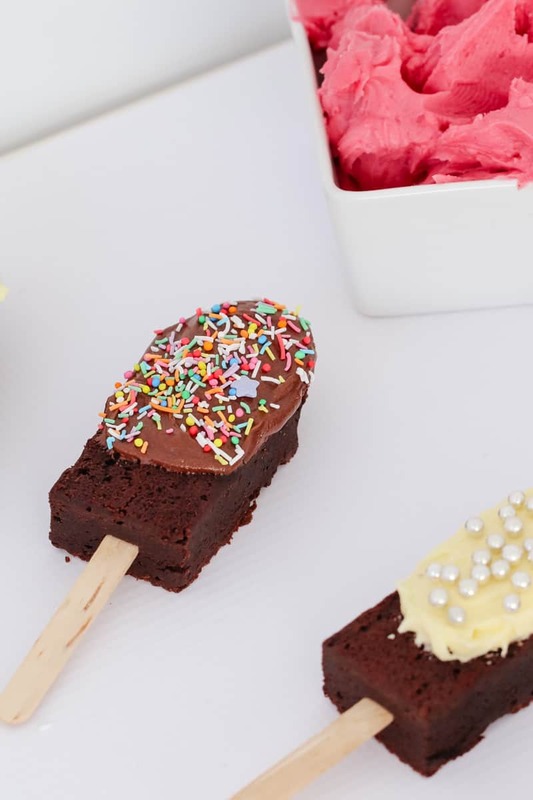 If you’d like to stand the chocolate brownie pops up, insert the icy-pole sticks into foam. Aren’t they just the cutest little things! 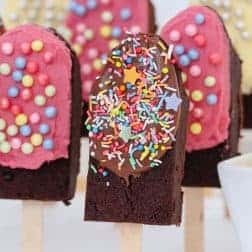 Click here for more fun kids party food recipes! Preheat oven to 160 degrees celsius and line a 20cm square tin with baking paper. Set aside. Place the butter into a microwave-safe bowl. Heat for 1 minute. Add the caster sugar and cocoa powder and stir. Heat in the microwave on 30 second bursts (50% power) until melted and combined - stirring each time. Allow to cool slightly. Add the vanilla extract and the eggs and whisk until combined. Sift the plain flour into the bowl and mix gently. Pour the brownie mixture into the prepared tin and bake for 30 minutes or until just cooked through (do not overcook). Leave in the tin to cool completely. Trim any raised edges off the brownie so you have a completely flat square brownie. Turn the brownie over onto a flat board. 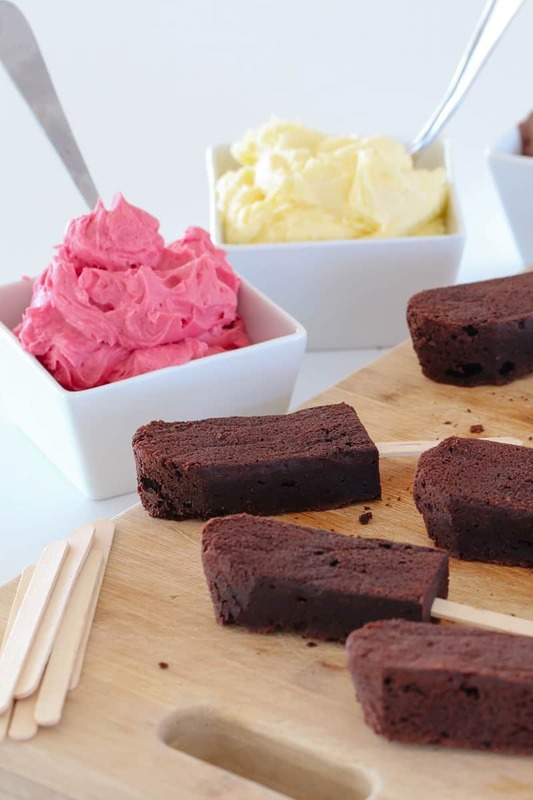 Cut the brownie into 8 equal rectangles (or 16 smaller rectangles if you prefer) and then shape the top of each into a classic rounded ‘ice-cream’ shape. 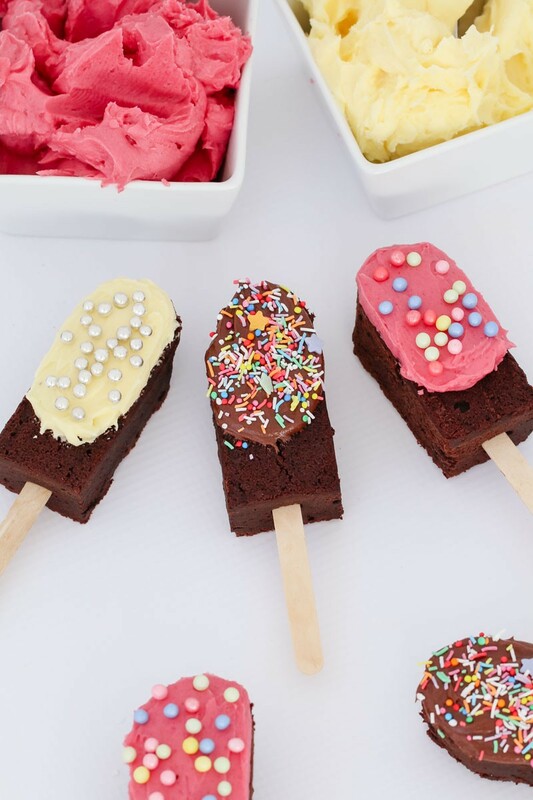 Place an icy-pole stick into the base of each brownie pop. To make the icing, beat the butter in a bowl until pale and fluffy (approximately 5 minutes). Slowly add the icing sugar mixture, milk and vanilla extract and beat until smooth and creamy. Divide into bowls and add 1-2 drops of food colouring per bowl. Beat until combined. 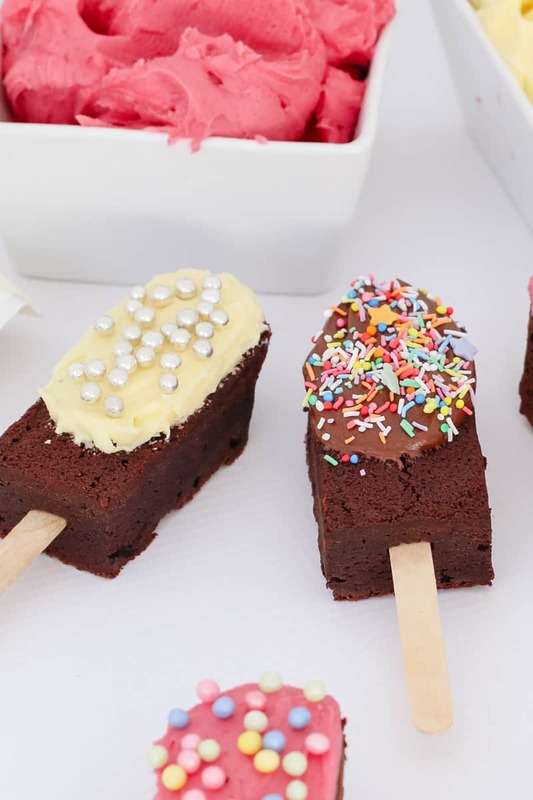 Spread the frosting over the top of the brownie pops and decorate with sprinkles, 100s and 1000s and silver baubles. Place the butter into the Thermomix bowl and melt for 3 minutes, 80 degrees, Speed 2. Add the caster sugar and cocoa powder and mix on Speed 4, 10 seconds. Scrape down the sides of the bowl. Add the vanilla extract and the eggs and mix on Speed 4, 10 seconds. Add the plain flour into the bowl and mix on Speed 4, 5 seconds. Scrape down the sides of the bowl and mix again for 5 seconds. To make the icing, place the icing sugar into the TM bowl and mix for 10 seconds on Speed 9. Add the butter, milk and vanilla extract and mix for 30 seconds on Speed 4. Divide into bowls and add 1-2 drops of food colouring per bowl. Stir until combined.